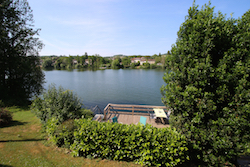 Les Séchoirs offers two Self Catering holidays cottages in South West France, the heart of the “garden of France” on the banks of the river Lot. Les Tabacs sleeps 4-6 and Les Pêcheurs sleeps 5. Each comes fully furnished and equipped with everything you need to either enjoy a beautiful relaxing self catering holiday in South West France or spend a few nights en-route to another destination on a Chambres d’Hôte (B&B) basis. However, don’t take our word for it, please read the latest reviews from our guests. Our prices for Self Catering holidays cottages in South West France vary with the season and the table below provides information relating to prices for each holiday cottage / gîte per week (7 nights) together with a calendar showing availability. Having decided which gîte best meets your needs, please select the preferred dates from the appropriate calendar below to check availability. Vacation rental weeks usually start on a Saturday. However please feel free to contact us if you wish to discuss your requirements; for example, your preferred dates do not appear to be available, or if your dates are outside our published season and/or partial weeks; a modified rate may apply. N.B. The French “Taxe de Séjour” is payable by each adult (age 18 and over) for each night’s stay. The rate is €1.20 per night which will be payable before departure in cash. The rates above do not include the Taxe de Séjour. In addition, where heating is necessary in the cooler months, €10 per night will be charged to contribute towards the additional costs relating to electric heating and or fire-wood. A non-refundable deposit of 25% of the total amount is required at the time of booking yourSelf Catering holidays cottages in South West France. The final balance should be paid within 6 weeks prior to arrival. A refundable security / damage deposit of €300 is also required per holiday cottage / gîte and should be paid together with the balance of the booking. Payment should be made by electronic bank transfer in Euros. If easier, we can accept payment in GBP (sterling), please contact us and we will advise the appropriate exchange rate and provide details. N.B. All bookings are subject to our terms and conditions. Les Séchoirs by drone / vidéo prise par drone ! Flying, Hang Gliding and Drone Lessons! Lot et Garonne – a well kept secret! Copyright © 2019 Les Séchoirs. All Rights Reserved.